One of the most thrilling things about the wonderful scent weekend in Berlin (Experimental Scent Summit & Art and Olfaction Awards) was the opportunity to meet in person people we had previously only known online. One such individual for me was Miguel Matos, whom I’d know primarily through his writings for Fragrantica. What I didn’t know was that Miguel has done so much more! 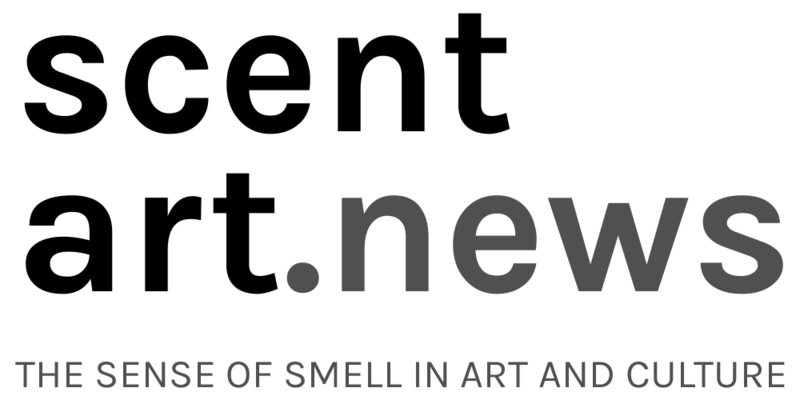 It is always humbling to realize how much great stuff is happening out there, stuff that even those of us–supposedly “in the know”–don’t even know about at times (and which reinforces our belief for the necessity of something like Scent Art Net & News). It was clear from our meeting, though, that Miguel is very much aligned with our vision, and we’re very pleased and proud to include him as our newest advisor/associate! The exhibit, housed in the cistern of the contemporary arts center, takes its title from the eponymous book of the philosopher Maria João Ceitil. Miguel delivered an excerpt from this book to the perfumers to translate their impressions into scents. To the scents is added a soundtrack with the voice of Ondina Pires (Portugal). The exhibition is accompanied by a beautiful bilingual catalog (Portuguese/English) that includes a CD of Pires’ music. You can learn much more about this intriguing exhibition here. As a scent curator, Miguel’s first show was Project Synesthesia at Miguel Justino Gallery in Lisbon, along with the project room Per Fummum. Miguel had his own art magazine for 15 years and was an art critic for Time Out Lisbon. He wrote the books Artistas Portugueses em Discurso Directo (interviews with Portuguese contemporary artists). He currently directs his own cultural magazine, Umbigo, and contributes texts to museums and art galleries. Miguel joined Fragrantica in 2013 and edits its Portuguese version Fragrantica.com.br. He is a perfume collector specializing in vintage perfumery and the organizer of monthly talks called Vintage Perfume Sniffing in Lisbon. Miguel also organizes conferences on perfume and writes for BeautyAlmanac.com and is an Honorary Member of the International Perfume Bottle Association. He is the creative director for the scent line SP Parfums by Sven Pritzkoleit. His writing was recognized at the Fragrance Foundation Awards and the Perfumed Plume Awards in 2017. Tags: creative industry, Fragrantica, Miguel Matos. Bookmark the permalink. Valuable information. Fortunate me I discovered your site by accident, and I am stunned why this accident did not happened earlier!